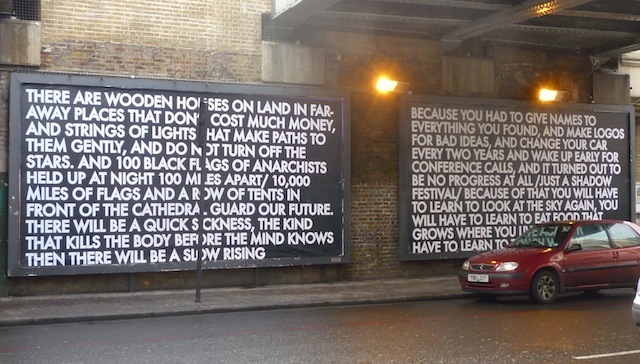 Hoxton-based Scottish artist Robert Montgomery has covered three huge billboards at the eastern end of Old Street with poetry. The poems 'reference the moral failure of Capitalism, the concerns of the Occupy movement, and new ideas of freedom in the city'. Indeed, the billboards are almost opposite the former Old Street Magistrates Court which Occupy were occupying, before they got turfed out at the end of January. 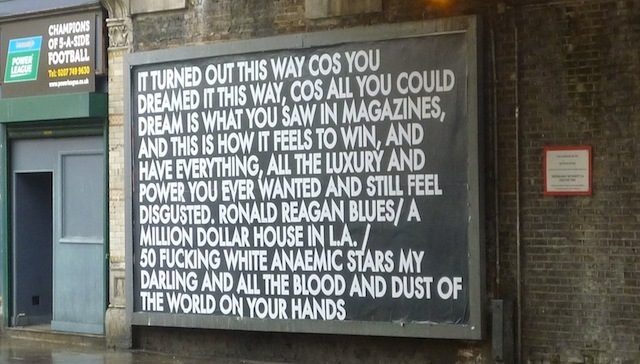 The billboard installation is part of Montgomery's show It Turned Out This Way Cos You Dreamed It This Way at KK Outlet, Hoxton Square. The show runs until 25 February, free entry. Read an interview with Montgomery in the Independent today.